December is all about Christmas. Our homes are decorated with Christmas trees, garlands, wreaths and December's favorite flower, the Poinsettia. On December 12th., we celebrate National Poinsettia Day. No flower says Christmas like the beautiful Poinsettia, as it symbolizes "Good Cheer"! First, we must pronounce it correctly: It is "Poin-set-tia" not "Poin-set-ah". Next, to capitalize or not? It depends. The Associated Press style manual capitalizes Poinsettia, but plant names are usually not capitalized, even when they are named for a person. The only exception is when proper nouns are used as in "black-eyed Susan". We are going with APs manual and will capitalize Poinsettia! The plant's connection to Christmas dates back to Mexico in the 16th. century. Legend has it that a young girl was worried because she was too poor to get a gift for Jesus's birthday. An angel tells her anything given with love is fine. The girl gathered weeds from the roadside and placed them in the manger. Miraculously, the weeds bloomed into beautiful red stars. The shape of the Poinsettia flower and leaves are thought of as the symbol of the Star of Bethlehem which led the Wise Men to Jesus. The red colored bracts symbolize the blood of Christ. Poinsettia plants are native to Central America, specifically the area in southern Mexico known as "Taxco del Alarcon". The Aztecs used the plant as an antipyretic and the source of a red dye. Plus, it was a symbol of Aztec sacrifice and purity. It derives its common English name from Joel Roberts Poinsett (1779-1851), an American botanist and the first United States Ambassador to Mexico. He found the plant in Mexico and introduced it to the U.S. in 1825 by sending cuttings to his home in Charleston, NC and gifting cuttings to his friends. It wasn't until the early 1920's when Paul Ecke, Jr., a second generation farmer in California discovered a grafting technique which caused the seedlings to branch, that the Poinsettia started to take root in American culture. National Poinsettia Day was created to honor him as the father of the Poinsettia industry and the date of December 12th marks the death of Joel Roberts Poinsett in 1851. 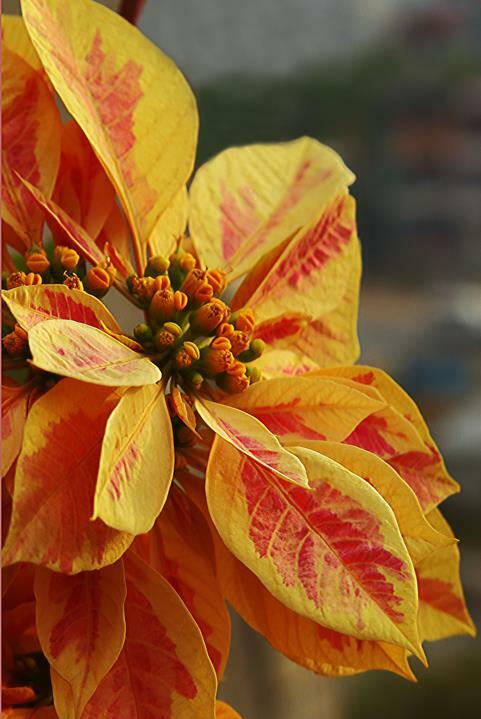 The flowers of Poinsettias are very small and yellow in color. They are the clustered buds in the center, called "cyathia". The most decorative part of the flower are the colorful bracts, modified leaves. Left to its own devices, a Poinsettia bush can grow to heights of 10 to 15 feet as a small tropical tree. Today there are more than 100 varieties of Poinsettias. They come in the traditional red, white, pink, burgundy, fuchsia, yellow, purple, marbled, speckled, and several colors blended together. They account for about one-quarter of flowering potted plant sales--over 34 million are sold in a year's time. This is 23% of all potted plant sales, and is the highest-selling plant in the United States. About $60 million dollars' worth of Poinsettias are sold in the 6 weeks before Christmas. California is the top producer with 6 million pots sold, followed by North Carolina with 4.4 million pots, Texas with about 3.7 million and Florida and Ohio with over 3 million pots each. There is a misconception that the Poinsettia is highly toxic. It was brought on by a 1919 urban legend of a 2 year old child dying after consuming a Poinsettia leaf. At the time, the cause of poisoning was incorrectly determined to be a Poinsettia leaf. It has been proven that the exposure to the plant causes only mild discomfort. Reactions include a mild, itchy rash, a mild stomachache, vomiting or diarrhea, minor eye irritation, and an allergic reaction in sensitive individuals. Symptoms usually go away without medical attention. POISINDEX, a major source for poison control centers, says it would take 500 bracts for a 50 pound child to eat to accomplish levels of toxins found to be harmful. No deaths resulting from Poinsettia ingestions have ever been documented. Poinsettia was taken in the village of Sarangkot in Nepal. The village is located on Sarangkot mountain at an altitude of 1600 meters (5250 feet) . We were on our way back to Pokhara after viewing and capturing a spectacular sunrise over the Annapurna Range of the Himalayan mountains, one of the largest mountain ranges in the world. It is available in table top to wall size, triple matted and with or without a frame. The matted versions are yours at a 10% discount and the framed matted versions in sizes 11x14 and larger can be yours at a 15% discount. Stop by and see us on Monday through Friday from 10a.m. to 12noon and 1:30p.m. to 5p.m.